This season’s tough schedule has finally caught up with the Wilfrid Laurier University men’s football team. The club is enduring what is possibly the most difficult three weeks of matchups in Ontario. They headed to both London and Hamilton to face two of Canada’s best teams, the Western Mustangs and the McMaster Marauders. The lost by scores of 61-20 and 27-10, respectively. They will face another difficult team, the Guelph Gryphons, at home on Oct. 25. The Hawks were dubbed the 10th-best team in the country heading into London and now find themselves at 4-3, clinging to the sixth and final playoff spot in Ontario University Athletics. At this time last year, the Hawks were 1-6. The Mustangs, who are now 5-2 after a loss to Guelph, dismantled the Golden Hawks by a score of 61-20 on Oct. 9. Laurier was simply not ready for the power the Mustangs brought to the offensive and defensive side of the ball. “They are a powerful team, you can see why they are in the elite class in the OUA,” said head coach Michael Faulds after the loss to Western. The loss was a wake up call for the Hawks defence, as they went into Hamilton to face the Marauders, only allowing the undefeated offence to score 27 points. This is the fewest amount of points that McMaster, who is now 7-0, has been able to score this year. Second-year linebacker Nakas Onyeka had 11 tackles in his first start, including two for a loss. He attributed the strong defensive play to a good week of practice. Top Canadian Football League prospect Chris Ackie also poured in 11 tackles in the loss. Unfortunately, the crushing defeat at Western failed to light a fire under the Hawks offence in Hamilton, as they looked overpowered by a strong McMaster defence. Quarterback James Fracas was rushed out of the pocket on several occasions on Saturday and was unable to find any options downfield for most of the game. After finding wide receiver Greg Nyhof early in the game for a touchdown, Fracas threw three interceptions over the course of the tilt and completed less than half of his passes, as he went 13 for 28 in Hamilton. As the leader of the offence, Faulds believes Fracas needs to work on staying focused in tough situations. McMaster also has four fifth-year players in their defensive secondary, which proved to be a major reason why Fracas had such a difficult time finding open receivers in the open field. Running back Dillon Campbell quietly picked up 129 yards in Hamilton, however he had his first game without a touchdown. According to Faulds, the minimalized rushing threat was due to the lack of fear the Hawks passing game imposes on elite clubs. “What happens is they expect the run, so they really start to key in on it,” he said. The Hawks now look ahead to their final game of the season at home against the Gryphons, who now sit at 6-1. Depending on what happens with the Gryphons, an enormous series of tie break scenarios ensue, including possible visits to Western or Windsor. The Hawks could even end up hosting a playoff game at University Stadium and will face either Ottawa, Windsor or Carleton on Saturday November 1. 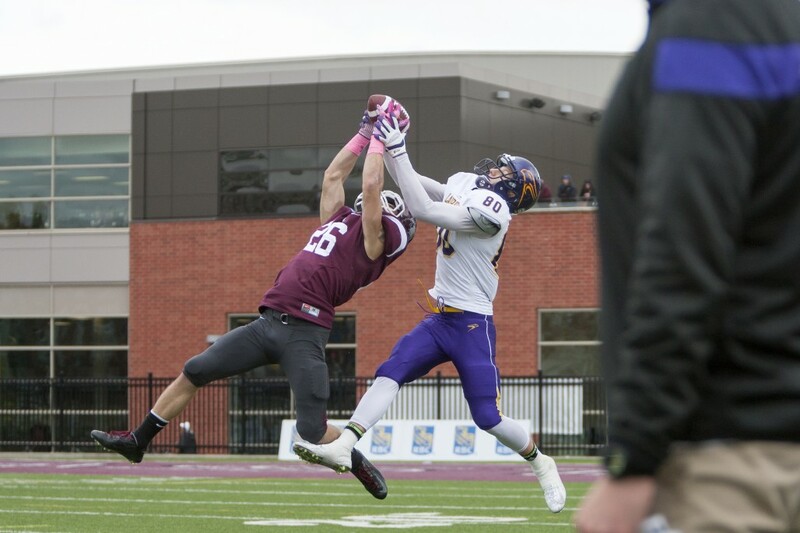 Laurier's football team loses 10-27 to McMaster. Considering how last time we were at McMaster we lost 0-43, I will take it.